This uniquely designed Russian knife is definitely more than meets the eye. If you’re into camping, this knife has many potential applications for that weekend trek through the wilderness. As woodworkers, we find all kinds of sources for materials, and skateboards are not new to the list. However, this video showcases an elegant conference table constructed of the wooden planks that hold so many great memories of scraped knees and broken bones. With the tiny house craze sweeping the nation, and houses being built out of vans, small boats, and other various vehicles, we can’t leave out the box truck. Take a look at this time-lapse video for the full build of this tiny house on wheels. Love it or hate it? 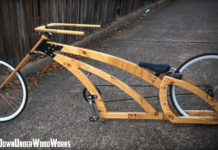 I get inspired every time I watch a meticulously handmade project that is not only interesting to look at but also meets functionality requirements. 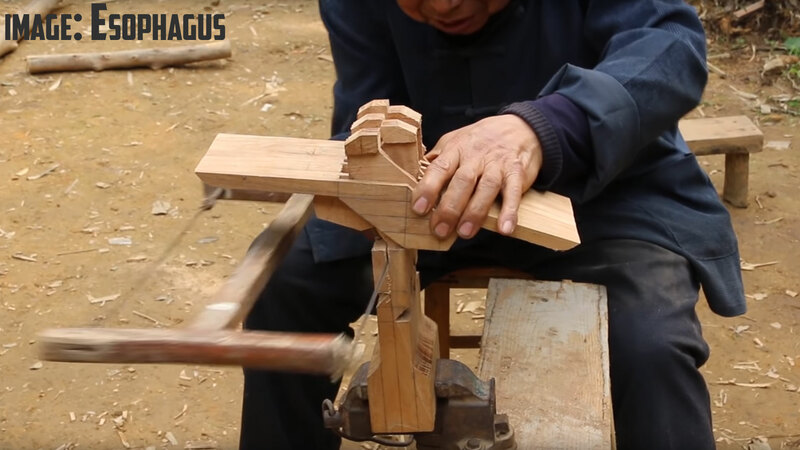 Check out this children’s stool from Esophagus and the attention to detail in order to make it from a single board with only hand tools. The little man’s haircut is great too. If you have ever considered metal working, you’ve probably seen the premium a good anvil fetches regardless of the source or dealer. Greenridge Metal Works shows great ingenuity by constructing two anvils from materials that were scrapped at a salvage yard. A rock that bends? Yes…It does exist. This video from The Action Lab shows off the elasticity of a rare sandstone that bends before it breaks. This itacolumite might just keep you from getting stuck between a rock and a hard place. The Swiss Army Knife, beloved by many around the world and a really useful tool for the survivalist can also be used to sew! This quick instructional video showcases one of the many functions of the versatile, timeless knife that so many have come to carry for generations. Pallet wood – a fairly easy material to acquire at a reasonable price with potential for many projects.This video from Field to Farm demonstrates how to use pallets to keep the cost of building that new shed, mancave, game room, etc.low enough for even the tightest budgets. We recently took a look at the dragon tail twist in forging. 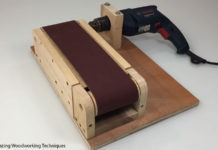 This video from Old Hickory Forge showcases a few additional basic twists you can add to your metalworking to add some flare to your work. I’m not leaving out the wood turners out there. There are center finders you can buy to help make sure you get your piece balanced perfectly between centers, and for square stock, it is fairly simple to find the center by drawing lines from corner to corner. If you find yourself with cylindrical stock without the center marked and need to find it quickly, this small jig can be a real time saver. Great videos. Old boy making the stool kind of puts the lie to the need for expensive, fancy tools doesn’t he? I don’t think there is anyone promoting the fact that you need expensive, fancy tools to make great stuff. We all know a lot can be accomplished with just a few tools. And we also know that a nice vehicle will make a long trip more enjoyable. My roadtrips to Biloxi in the towncar were comfortable, but won more money when I took the HD2500! Whoa!!! Too much good stuff….. It never dawned on me that the hole in the awl on your Swiss Army Knife could be used for sewing…. too cool…. now I want to make and anvil and make a shed out of pallets…. too much fun…. The circle finder is kind of cool. I made one for 1 1/4″ dowels a while back. It will work on any smaller sized dowels. It is simply a thin piece of pine that was cut square, then at a 45-degree angle, I used the band saw to cut a slot long enough for a utility blade to fit in, and wrapped the two sides with more thin wood. place the dowel into the corner and tap on the other end, turn 90 degrees and tap again and the point of the cross is dead center regardless of the diameter of the dowels. why must there be haters for “expensive” tools. For every tool, there are increasing steps of expense for that tool. 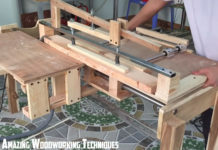 hand saw > jig saw > bench band saw > fahcy expensive band saw > wizard’s wand with a built in cutting feature > etc…. How you choose to craft should not matter to anyone but the person executing the craft. So watch the videos, choose to enjoy them or not. But for the love of the internet gods, why spread dissent over another person’s choice of tool or question those that have decided to buy upl!? Support anyone who has made the conscious choice to craft something. I don’t think that those promoting less expensive items are badmouthing the more expensive. What I do find is that having less expensive ways of doing so many things allows almost everyone to enjoy hobbies and experiment to find which ones make them happy and which ones that they can afford. Almost 50 years ago I made a crochet hook out of a tinkertoy stick. Guess what, I found that I really wasn’t interested in crocheting at all.